You are here: Home / Why Go Solar? The solar industry has seen astronomical growth over the past several years on a global scale. Innovation has driven the technology’s efficiency up and the costs of production down. Since 2008, solar module prices have fallen by over 80%, while a new world record in efficiency has been reached at 44.7%! Compliment these new standards with generous state and federal incentives here in the United States, and the perfect storm of solar viability has struck. 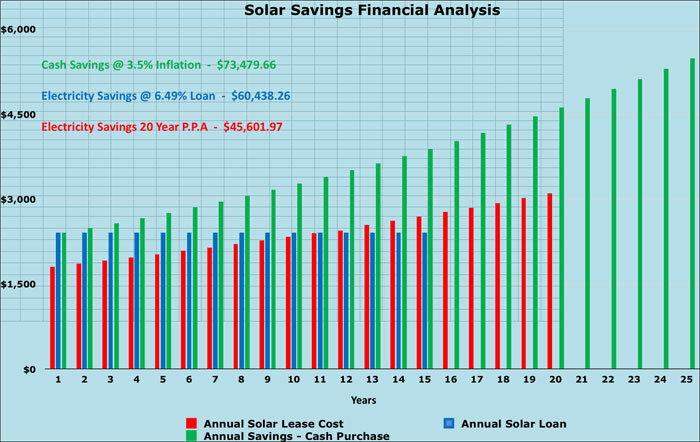 Solar power is a safe and sound investment, and by utilizing our unique solar program, savings are quick and profound (not to mention environmentally friendly). Our clients can now take ownership of their power production; an asset of growing importance. Think about how much the cost of electricity has increased over the past ten years. Wouldn’t you love to be paying now what you did back then? Going solar affords you that opportunity: replace volatile, escalating utility expenditures with a lower, fixed energy investment. As sure as the sun rises every day, you will watch the money you save grow year after year, with our real time, electronic monitoring system. Track the productivity of your investment for the next 25+ years!